The BeeBrain Lite is the next generation of the BeeBrain Flight Controller from NewBeeDrone. Featuring an F4 CPU for handling the latest filtering and PID tuning to provide hyper-smooth flight characteristics. No longer will you have to add the weight of a second stack like the previous generation BeeBrain V2, or add on an aftermarket board. An adjustable 1mw to 25mw VTX is built into the FC board with fully customizable BetaFlight OSD to give you all of your flight statistics. Not only is the BeeBrain Lite powered by a full range built-in receiver, it also takes advantage of diversity technology by using an external antenna and a built-in PCB antenna to give you incredible signal performance when flying around the most noisy environments. A first in this size class of brushed drones, the BeeBrain Lite features active motor braking through the unique design of our patented brushed motor active-braking system. This gives you an even closer feeling to larger-sized brushless quads when performing freestyle moves or fast racing courses. No other flight controller will make your brushed motors feel this good. We looked at current micro-sized brushless motors as an alternative but due to the size, most didn't use bearings which provide a less than smooth flight experience. Additionally, for the added cost, weight, wear issues, and battery usage, we felt creating our own braking system with our current system seemed better. We spent a year developing the smallest and most efficient OSD solution in flight control. 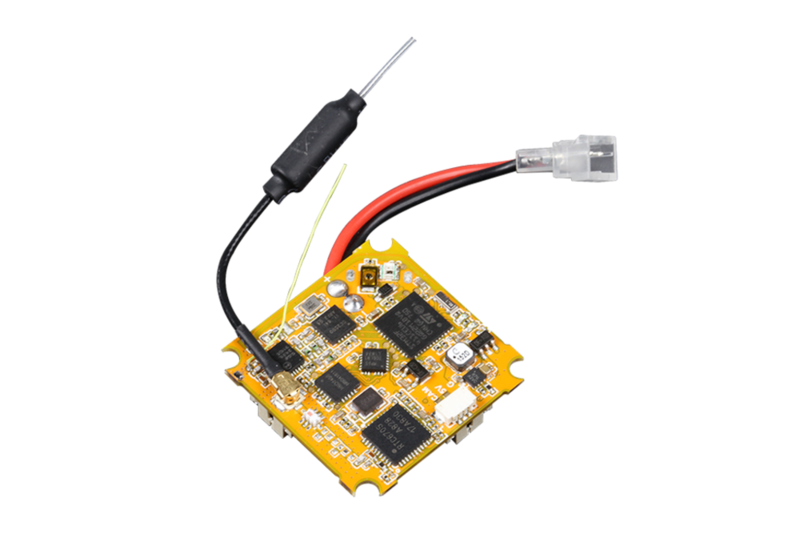 By simulating the OSD chip with MCU technology, our brand-new MCU chip is fully compatible with BetaFlight OSD, uses 75% less power, and takes up 75% less space than the current OSD chip in the market. This allows BeeBrain Lite to pack all the extra features without making any compromises and flies better than anything else in the market. 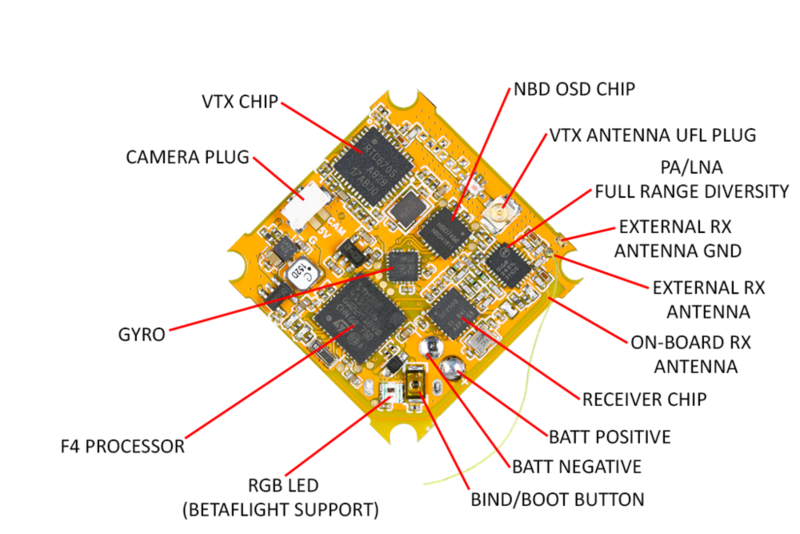 Thanks to the unique design and engineering, the BeeBrain Lite is able to fit all of its components on one board. The Lite comes in around 1.7g lighter than the previous BeeBrain V2 Flight Controller stack - almost 2g lighter without sacrificing any features and providing better processing power. This leads to a better center of gravity in the aircraft with the weight being lower and better battery life with less weight. Forget about added extra weight and messy wiring just to be stuck with one type of LED effect. The bottom of the Lite board features two super-bright RGB LEDs that are fully compatible and configurable in the BetaFlight GUI. Change the color with up to 12 different colors, multiple effects from blinking, scanning, battery status, and more! Perfect for standing out in races from other pilots, making cool effects for POV flying/spectators, or just finding your quad after a crash in dark places.